Paulist Fr. 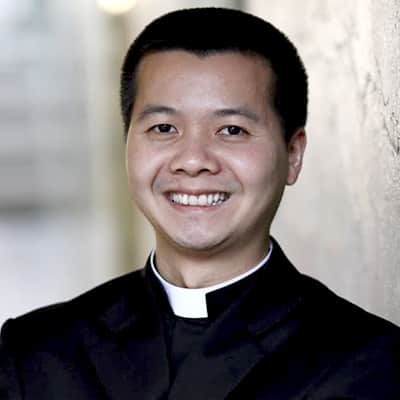 Dat Tran is our vocation director. He seeks out and works with men around the United States and Canada who are discerning a call to the priesthood and religious life. He lives at our motherhouse in New York City. Fr. Dat was born in Vietnam. As a boy, he immigrated with his family to California. He earned his undergraduate degree at the University of California at Berkeley. It was there that Fr. Dat met the Paulist Fathers at Newman Hall - Holy Spirit Parish, the Catholic campus ministry at Berkeley. He was ordained in May, 2011, by then-Archbishop Timothy Dolan of New York at our mother church, the Church of St. Paul the Apostle. In his first assignment, Fr. Dat served as associate pastor at St. Paul the Apostle Church in Los Angeles. After three years in that role, he returned to his Alma mater to became associate pastor at Newman Hall - Holy Spirit Parish. He served there until 2016 when he began serving as our vocation director. Learn more about Fr. Dat's life, and his own vocation story, at this profile. Please do not hesitate to contact Fr. Dat at (917) 830-5537 or be@paulist.org or via the Vocations section of our website. You can also learn more about Fr. Dat and our vocations outreach via Facebook, Twitter, Instagram, Snapchat, tumblr and Pinterest.